Plans for my 2018 SFG are dancing around in my head. In preparation for seed starting, I have ordered a heat mat c/w thermostat. In past years I've had good success germinating seeds without a heat mat albeit some seeds have taken a long time to get going. 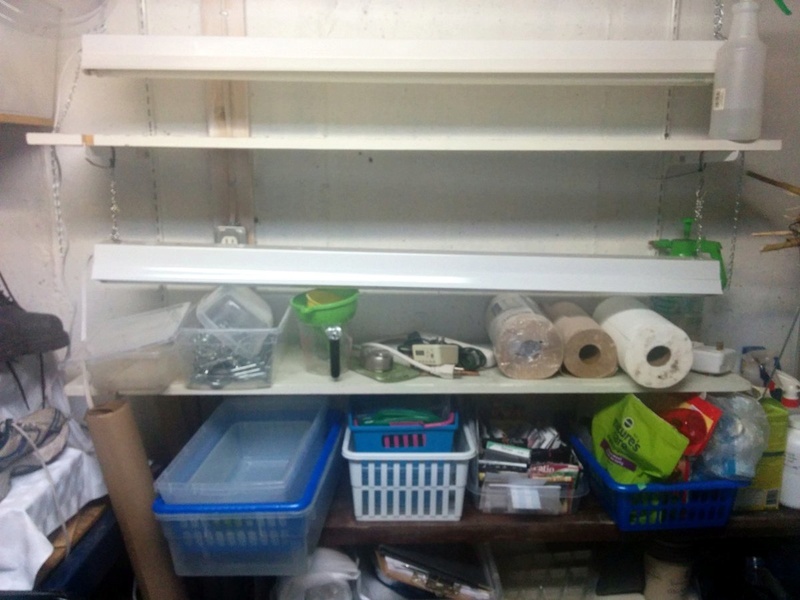 I'm also considering getting another 4 foot fluorescent shop light which will give me a total of three such lights. and a lot more flexibility for the seedlings. Yay, your first posts on your 2018 thread! Now I won't have to make the trek through the frozen Northeast to have a word! @sanderson wrote: Yay, your first posts on your 2018 thread! Now I won't have to make the trek through the frozen Northeast to have a word! I still have to review 2017 and make my closing statements on that thread. 1. Review and make notes on last year's SFG - what worked, what didn't, etc., etc. 2. 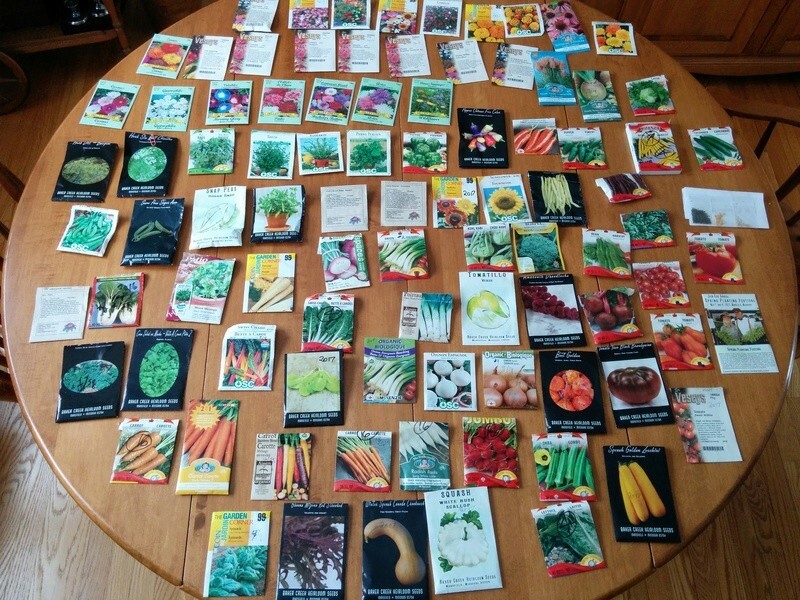 Seeds - decide what to keep, what to toss and what to buy. 3. Seed starting - Cleanup seed starting equipment and containers. I'm not getting anywhere fast. 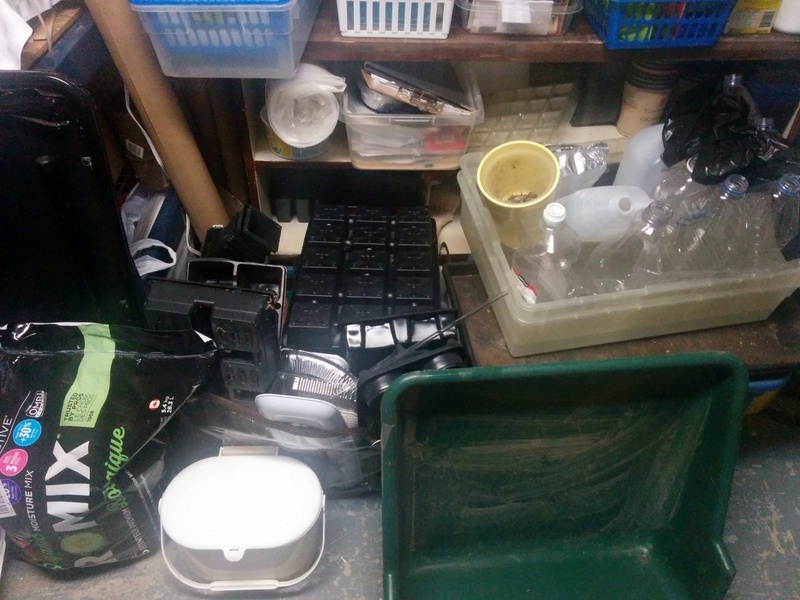 The most I could do today was to clean some trays, plastic pots and packs in preparation for growing seedlings. Need to start getting my act together. It's snowing outside and I don't have the energy to go out and do any snowblowing. Pathetic. I spent NYD planning...so fun! Photos taken today of the backyard SFG and the SFG Table Top. These are for sanderson. 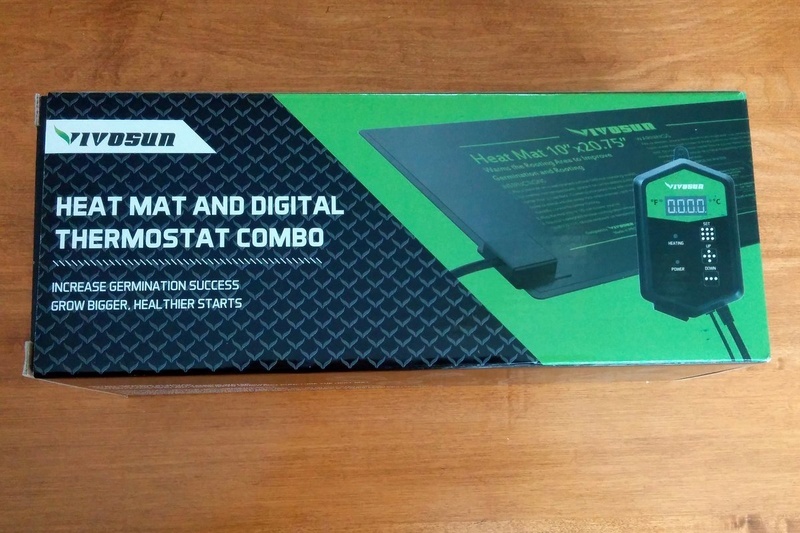 Look what arrived today ... heat mat c/w thermostat. I probably do not need this but thought I would splurge. The first test will be with microgreens. I may have to come out of retirement and get a part-time job to pay for these toys. Actually, now that our minimum wage went from $11.60/hour to $14 Cdn on January 1st. it may not be a bad idea. Today I spent what seemed like forever cleaning more pots and containers in preparation for seed starting and potting up. I didn't realize I have so many. Some of the plastic pots were used last year, some are from transplants (mainly flowers) we bought and some are what I scrounged from the recycle bin at one of the garden centers in Spring 2016/17. 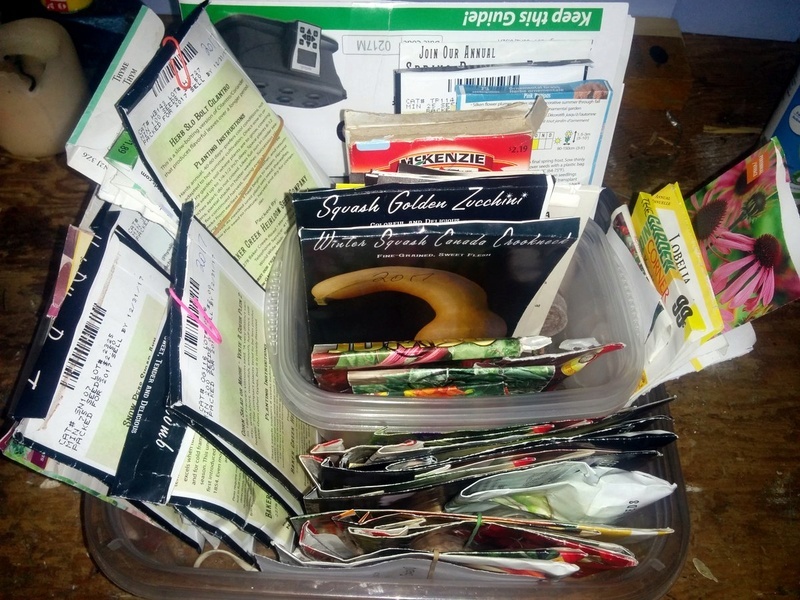 Then I have all kinds of other miscellaneous shaped containers which were used last year for microgreens and seed starting. I am scrubbing everything in hot soapy water, rinsing them off and then for good measure giving them a bleach bath (9 parts water, 1 part bleach) followed by a final hot rinse. 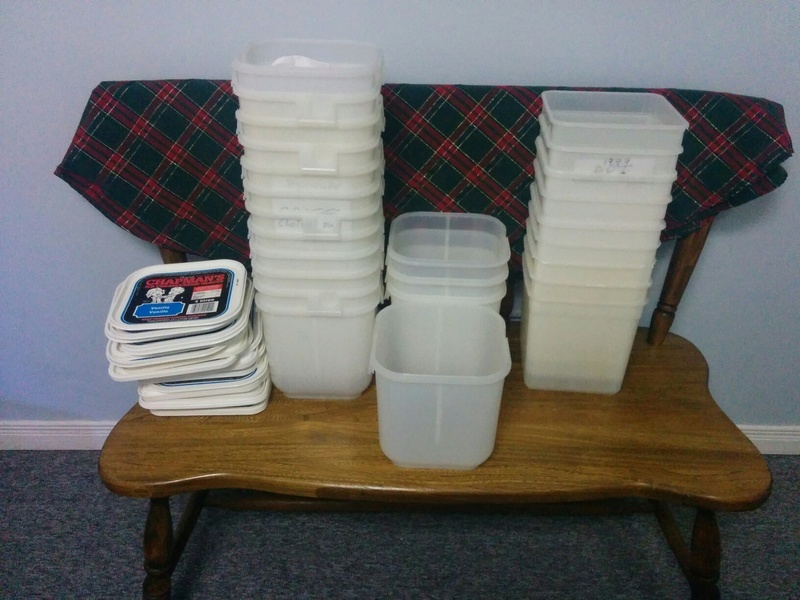 With all of this washing of containers I should have a good resume to get a job as a minimum wage dishwasher. Wonder who is hiring? We have been cooking some of our SFG grown Canada Crookneck squash in our new Philips Air Fryer. The quash really tastes sweet and delicious. We still have a couple of Crooknecks left in storage. Need to grow more this year. Again I have to thank sanderson for encouraging me to grow this wonderful winter squash. Can't wait to get the megatrellis back in action for a second season. I can't imagine going back to work! When would I find the time? I'm so happy you had success with the Canadian crooknecks. I can hold all 5 of mine in one hand. Each year, something does great for me and something fizzles. 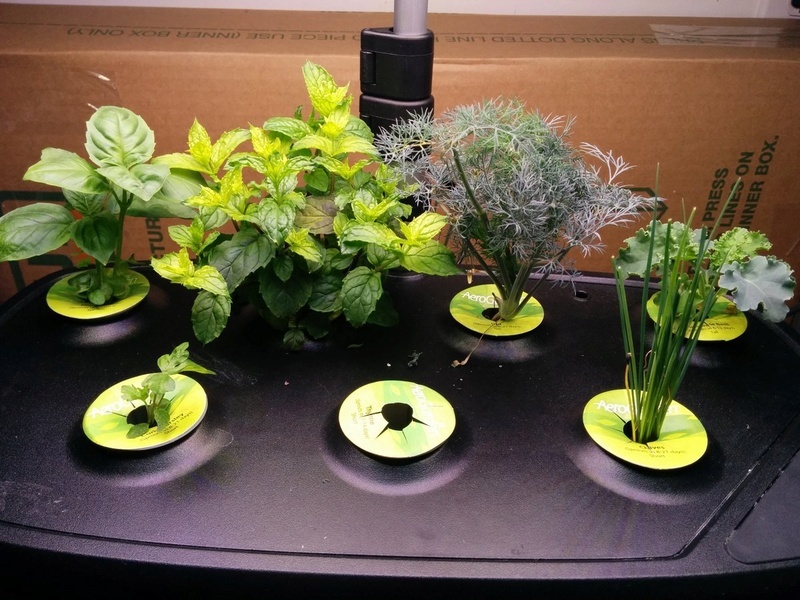 First - I am testing my heat mat & thermostat combo by growing a small batch of Arugula microgreens. 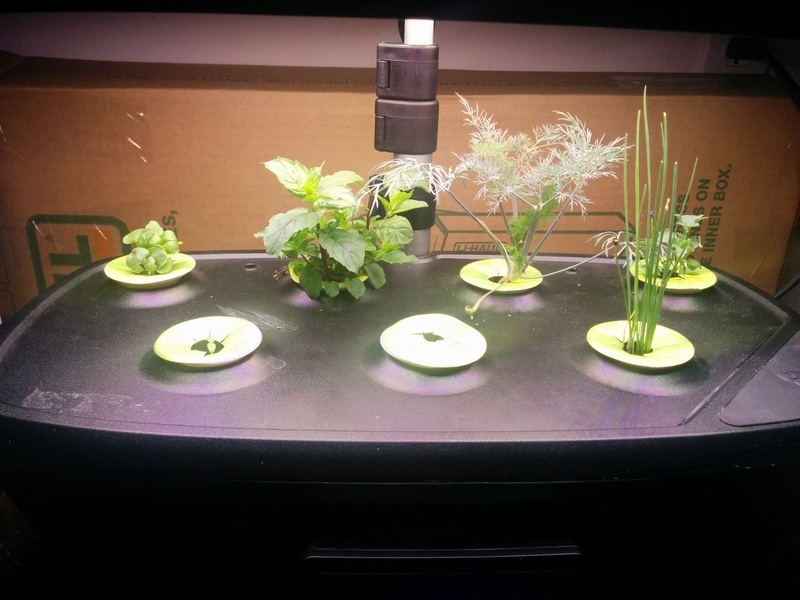 Second - Here is what is happening with the AeroGarden. Across the back from left to right are Basil, Mint, Dill and Kale which are are doing well. In front the Parsley is coming along, the Thyme has done nothing and the Chives are doing well. I've had to prune some of these things to keep them short while the latecomers catch up. That gave me opportunity to taste the Basil, Mint, Dill and Chives. 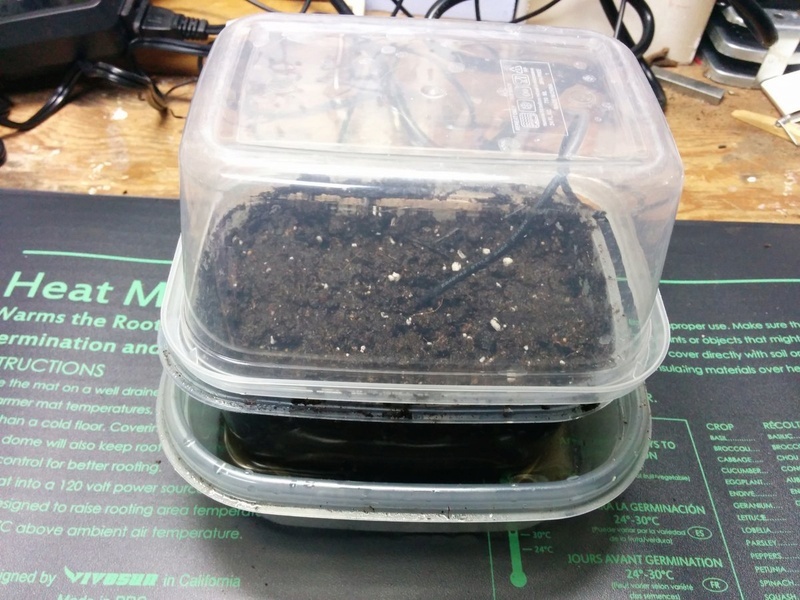 It may not be SFG but it's a great way to keep in touch with soil and plants while you are snowed in. I'm hoping to get some Winter Sowing started soon. After my Mom passed away last year, we found some ice cream containers when we cleaned out her house. She used them for storing crafts and so on. They are perfect for Winter Sowing (http://wintersown.org/). I'll have to make some changes to the lids since they are opaque and will not let in the light. Stay tuned for further developments. Didn't take long for the heat mat to do its thing with the Arugula seeds. 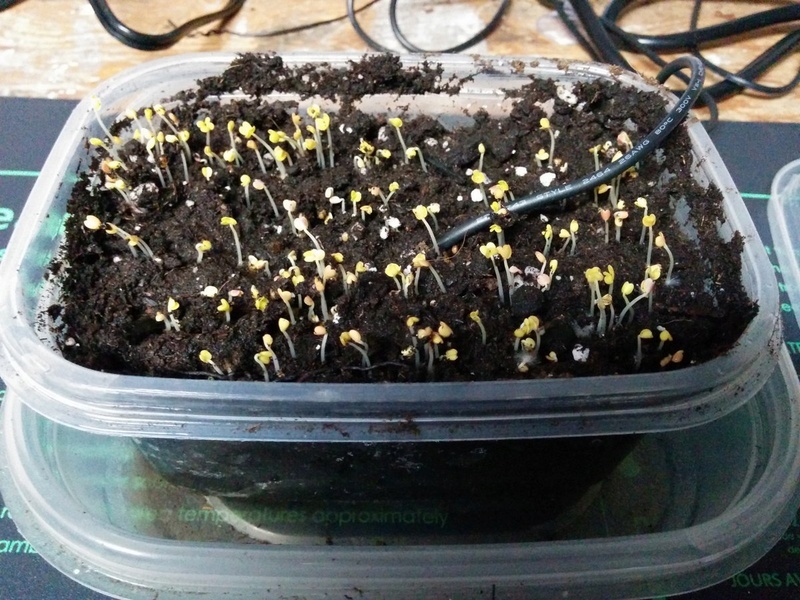 They were sprouting this morning after less than two days. Here is what they look like now. I've put them under a light so that they will green up. 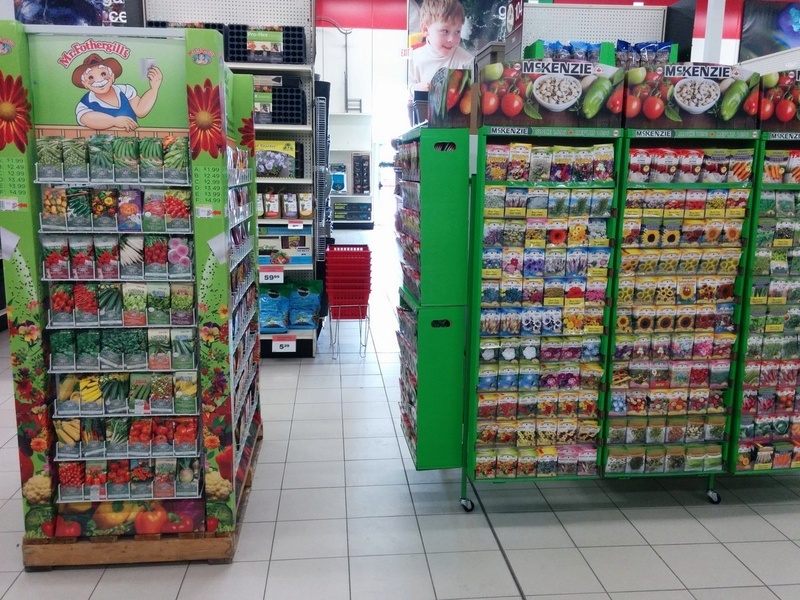 A lot of the stores are putting out their seed displays. This was in Canadian Tire (the everything store) today. 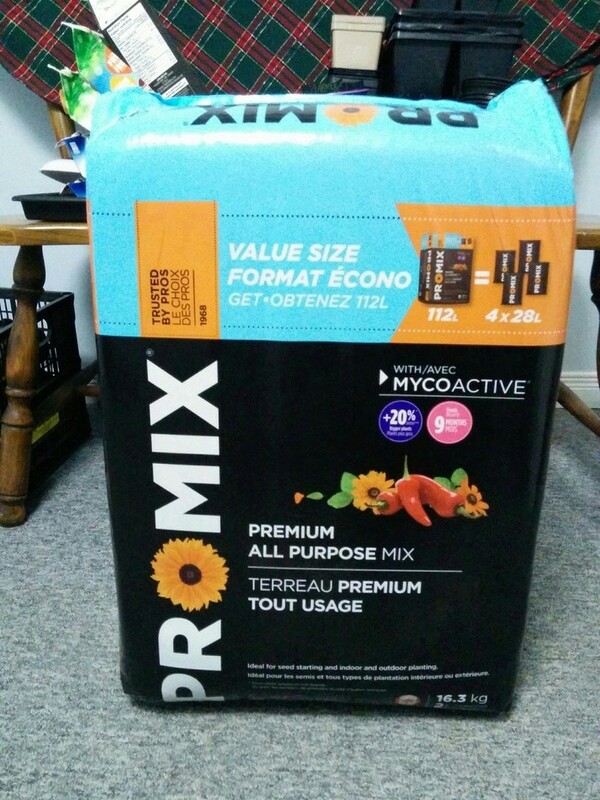 I needed some potting mix so I went to Rona Canada (like Home Depot) and picked up this 112 Litre (18 Kilogram) bag of ProMix for $17.99 Cdn. I was surprised to see that they had what looked like hundreds of bags of various types of potting mix inside the store. Normally they keep a few bags outside, and inaccessible, in their garden center during the winter and there is very little if any inside the store (especially large bags). 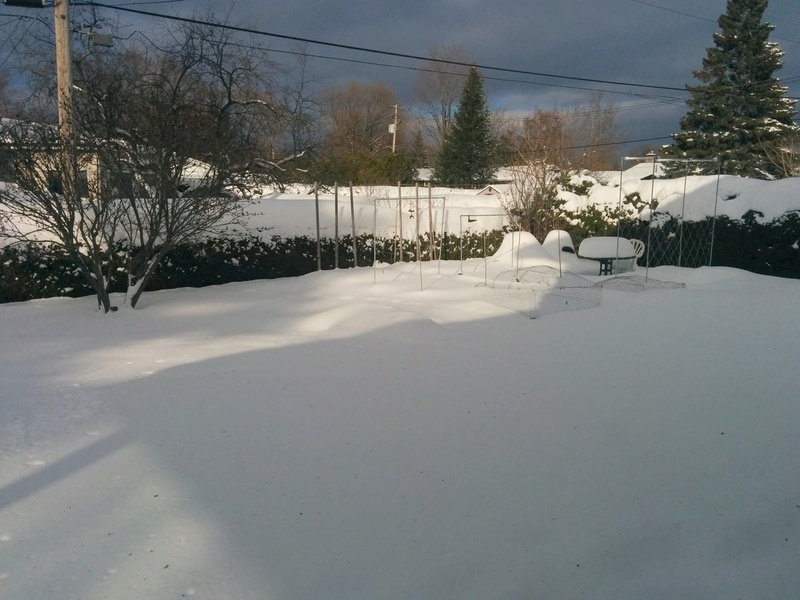 I was told that the difference this year is that marijuana will soon be legal here in Ontario and they are expecting the pot growers to purchase a lot of potting soil. Oh, yes, people who have never grown a tomato plant will now be rabid "gardeners". What are the ingredients in the all purpose mix? @sanderson wrote: Oh, yes, people who have never grown a tomato plant will now be rabid "gardeners". What are the ingredients in the all purpose mix? Will you adding any compost to the mix? I ask because when I buy potted starts, when I pull at the end of the season, the wad of peat moss is intact. @sanderson wrote: Will you adding any compost to the mix? I ask because when I buy potted starts, when I pull at the end of the season, the wad of peat moss is intact. 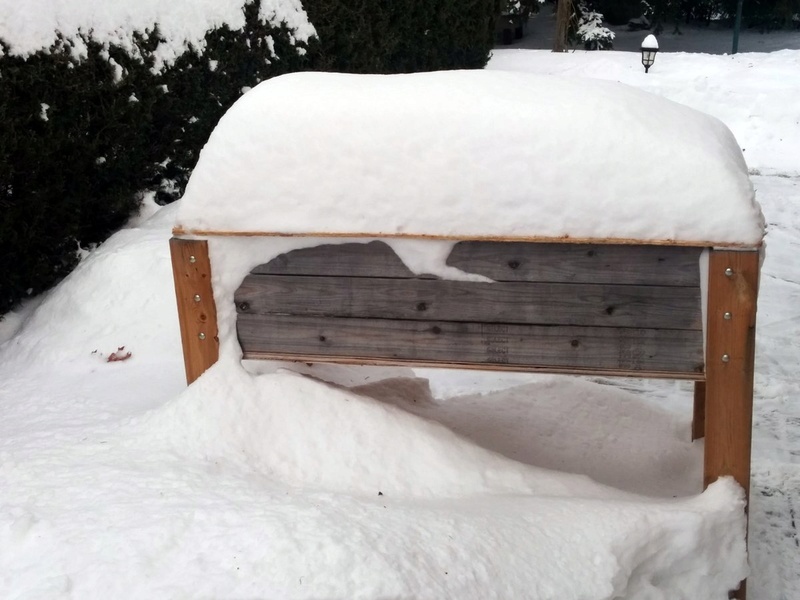 No compost. All of my compost is frozen solid. As well, last year I had some Mel's Mix available to use but not this year. 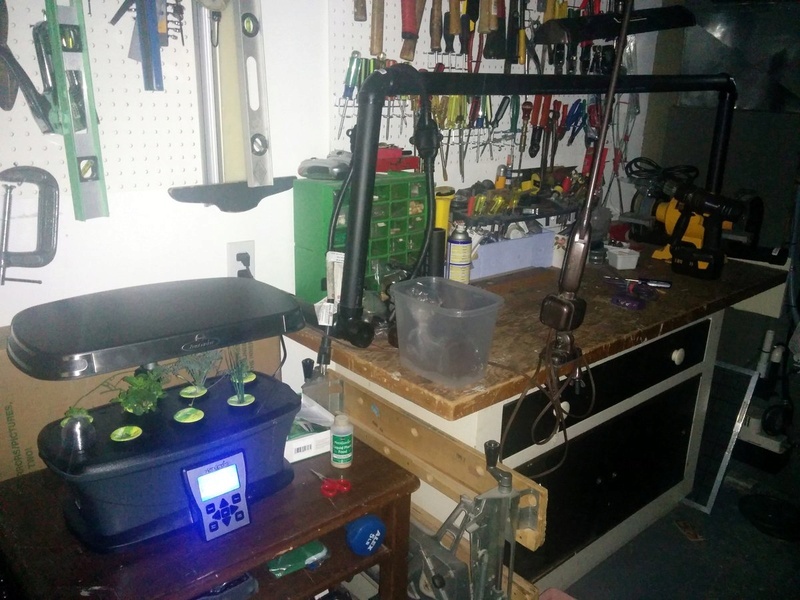 I joined a Square Foot Gardening Facebook Group and posted a photo of my SFG. Now I see that the Admin for that group is using that photo for the group's main photo at the top of the page. Maybe they change the group's photo on a regular basis. I noticed that. Yes they do. They had my photo of PVC frames on the table tops for several days.